A finish! I love this piece! It was my entry for the Splash of Colour QAL hosted by Myra@Busy Hands Quilts. I won the grand prize! I was shocked when Myra notified me that I was the winner. Thank you Myra! I quickly and I mean quickly went out this morning to get some pictures it is -12 Celsius but feels like -21 brrrrrr. A big change from yesterday morning when it was +12 and raining. The pop of green brings this piece to life. Being as green is my favourite colour it makes my heart sing. You can read more about the piecing here. I didn't add the ring of black and white around the compass before adding the white corners. I'm saying it was a design choice at the time and not that I may have forgotten to add it. Yup design choice! You can read about my pattern choice here. 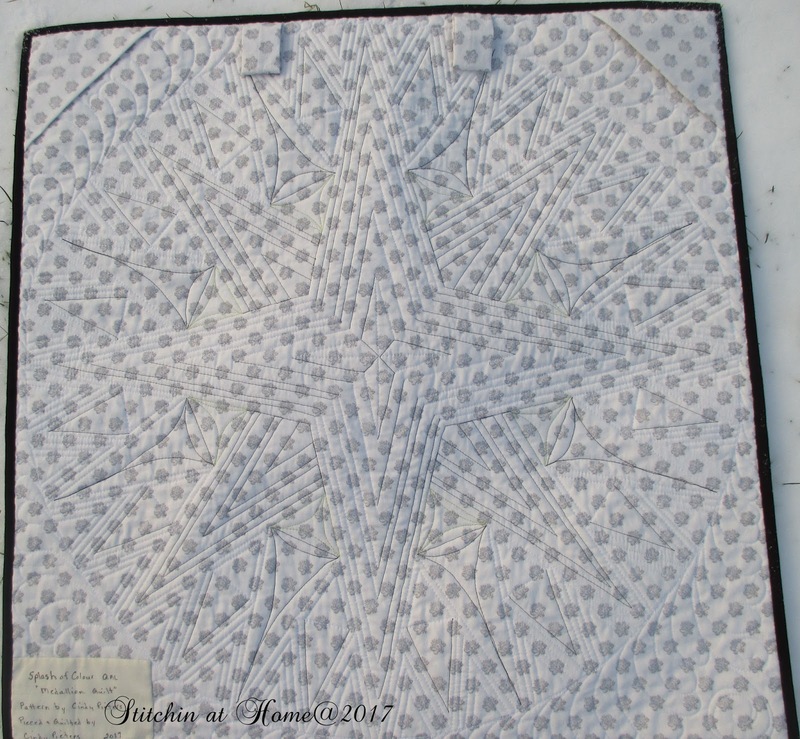 I was uncertain as how to quilt this piece. 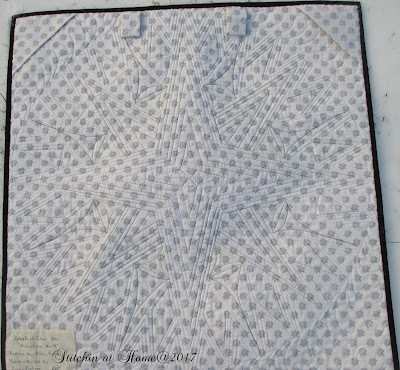 I knew I wanted straight line quilting in the compass points, other than that not sure. Once I started quilting it came together and I am happy with it. I used Aurifil #2692 on the black and white, Aurifil #2024 on the white and for the green Aurifil # 1231. 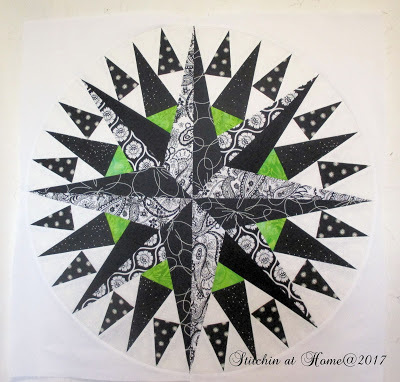 I used Quilters Dream cotton as I like how it hangs in a wall hanging. I like feathers, and quilted them in the white corners. My backing was pulled from my stash, it is Shabbylicious by fabsraps. I am not certain how long this piece resided in my stash. It is a beauty and well deserving of the prize. It is beautiful, Cindy, and congratulations on your win. 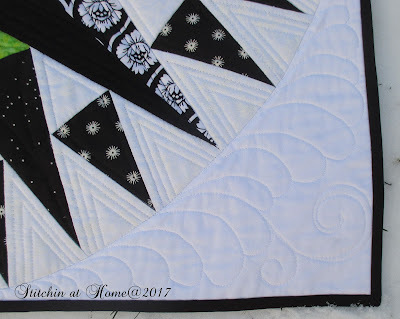 The quilting compliments the design and is fun to see on the back. This is AMAZING!!! Congrats on winning the grand prize! You made this pattern sing with your choice of fabrics and that fabulous quilting. A perfect accident indeed (errr, I mean design choice!) I think it is much more appealing without the ring. Congrats on your grand prize. I would say it's well deserved. Congratulations. It's a great piece. We had the same weather. It was like spring yesterday and then cold today. 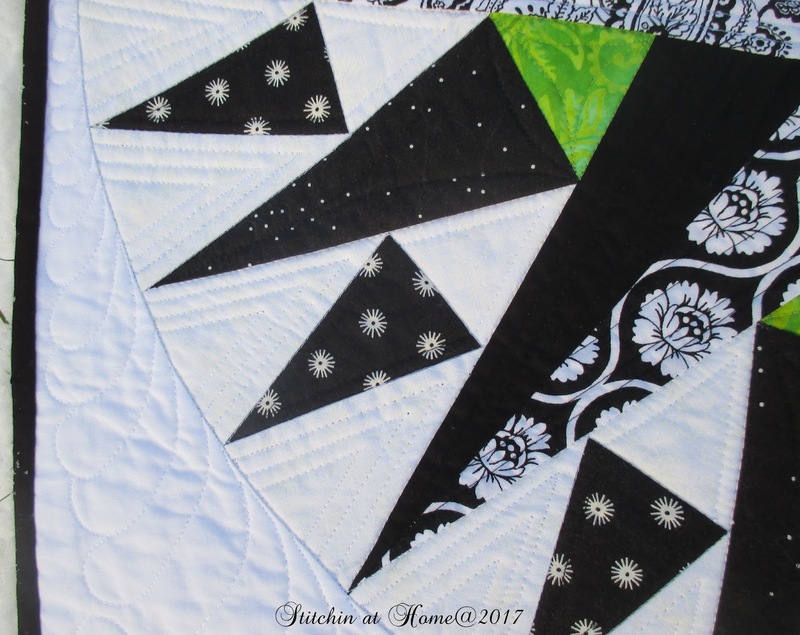 So pretty, the piecing and quilting. Of course, green is my favorite color. Firstly well done on the finish and secondly well done on the win! I loved seeing your quilt come together. I admire your patience with all those little pieces. And the green works so well with the monochrome. Blue is my favourite colour but the green really pops out here. It's so fun to work on a piece you can get really excited about. I can hear it in your words even now. Oh, I aspire to piece as well as you, Cindy! This piece will steal the show wherever you hang it. Congratulations on your first place! Congrats!! Lucky you on winning first place!!! Congratulations! The honour is well-deserved. It's a beautiful piece. 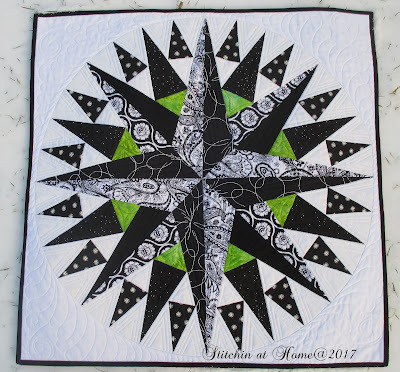 The design, the colors and the quilting just sing!